Hi everybody. 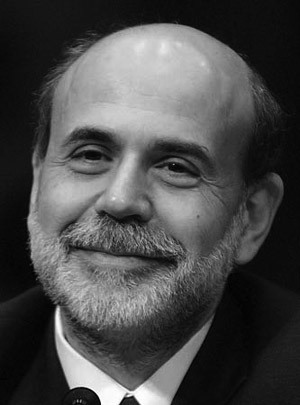 It’s me, Ben Bernanke. As many of you know, I’ve been extremely busy. During Quantitative Easing I and II, I’ve spent almost all of my time finding just the right amount of flation. This is very difficult for one person to do, but don’t worry — I have a calculator that helps me compute the perfect amount. Not sure it would be possible without my calculator; I can see why every other central banker in history couldn’t get it right and why all their systems ended in some sort of systemic catastrophe. Between my calculator and the advance of knowledge, monetary science is better understood at the present time than in those days of old. But what hasn’t changed is how much people hate things being hard. I know I do. And in spending time with my calculator, furiously pushing her buttons, I realized that QE I and II were just too hard for me. And in receiving a deluge of explicit and implicit inquiries from the market about when QE would end, what would happen when it did end, why QE wasn’t just blowing bubbles for the sake of blowing bubbles, I realized that QE I and II were just too hard for you all, too. So I sat down and said to my calculator, “Calculator, markets are too hard. Let’s make them easy. Let’s help boost assets prices with a new program called, Quantitative Easy.” My calculator didn’t reply but I could tell from the light reflecting off her display that she loved the idea. What is Quantitative Easy? Quantitative Easy will be a program run by me, Ben Bernanke, that will make asset prices go up. This in turn will lead people to be happy. It will get their juices flowing, their animal spirits will stir in their hearts, and they will buy things. If we all agree to buy things, even if we we can’t afford to, then everyone will get rich. Easy. How will it work? Asset prices, all of them, will go up. Like I said: QE I and II were too hard, people were constantly trying to figure out which assets would go up and when. Worse, people were worried that asset prices might actually go down at some point. Crazy, I know. Quantitative Easy is going to be easy. Everything is going to go up. Forever. What should I buy? A horse. A rainbow. Mykonos (which is for sale fyi). Netflix stock. A mansion in Vancouver. A 1987 Topps Mark McGwire card. A slightly used Japanese nuclear plant. US Treasuries. Portuguese bonds. The only limit is your own creativity. How can the Fed afford to do this given its balance sheet? That’s a good question. Next question, please. Where will the money come from? We have a very complex process, involving machinery and paper, too complex to get into here. Make it easy for yourself and don’t try to understand it. Just trust us. This sounds to good to be true. Is there a catch? No. Would I lie to you? Who wants a drink from the Interest Rate Hose? Ben, would you like to comment on rumors that you’ve hired Gideon Gono as your chief deputy? This seems to just be delaying the inevitable, but we have yet to see inflation get much above 3%. Ben has done a good job in the most recent announcement, just for that he gets a compliment!